I see a lot of improvement in Maths and Hindi. She has picked up reading ability as well. Quite satisfied with the progress. Would like to thank the teachers for all the efforts they have taken. It is a sad moment today for us as parents as well, as we have shifted our base from Ahmedabad and Dheer shall be parting with this wonderful school and its fabulous teachers and the entire staff. Words cant be expressed to what this school and teachers have done for making Dheer what he is today. Freedom to explore, freedom to communicate and freedom to be express is what Redbricks teaches. We cant thank you enough for whatever you have done for Dheer and us. We are indebted. A big thanks for bringing the smile on my child's face. Each one of you have worked hard to help her recapture her potential in different subjects. My joy is her recreation of her school at home and her take away from classroom. That's the best reward and learning experience for us as parents. Excellent efforts made by the kids for the project. The concepts were very clearly explained by the kids. The project models gave more clear idea to the kids for community place, animals and human beings Keep Going. 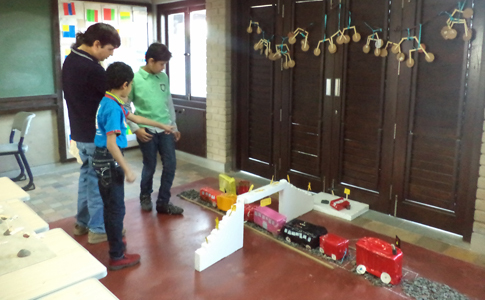 The models are more practical way, for the children to understand the project. No improvements. Project is nice, Practical knowledge is very good way of learning , this way children dont get mentally tired and also are able to remember things for a very long time. The concept is good, good to do the exercise after the visit to the particular place. It help them to share the practical knowledge. At the age they are good at what they are doing. We are happy with rohan's performance. He is becoming confident and more vocal, once again thanks to all teachers for doing wonderful job. School and teachers are doing a good job and will be happy to recommend to new parents. I am impressed with the detailed overall assessment of Shardul progress. Looking forward to develop the areas wherever he needs to improve by both school management and myself.